High malaria transmission heterogeneity in an urban environment is basically due to the complex distribution of Anopheles larval habitats, sources of vectors. Understanding 1) the meteorological and ecological factors associated with differential larvae spatio-temporal distribution and 2) the vectors dynamic, both may lead to improving malaria control measures with remote sensing and high resolution data as key components. 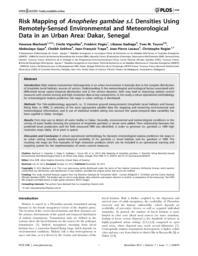 In this study a robust operational methodology for entomological malaria predictive risk maps in urban settings is developed. The Tele-epidemiology approach, i.e., 1) intensive ground measurements (Anopheles larval habitats and Human Biting Rate, or HBR), 2) selection of the most appropriate satellite data (for mapping and extracting environmental and meteorological information), and 3) use of statistical models taking into account the spatio-temporal data variability has been applied in Dakar, Senegal. First step was to detect all water bodies in Dakar. Secondly, environmental and meteorological conditions in the vicinity of water bodies favoring the presence of Anopheles gambiae s.l. larvae were added. Then relationship between the predicted larval production and the field measured HBR was identified, in order to generate An. gambiae s.l. HBR high resolution maps (daily, 10-m pixel in space). A robust operational methodology for dynamic entomological malaria predictive risk maps in an urban setting includes spatio-temporal variability of An. gambiae s.l. larval habitats and An. gambiae s.l. HBR. The resulting risk maps are first examples of high resolution products which can be included in an operational warning and targeting system for the implementation of vector control measures.